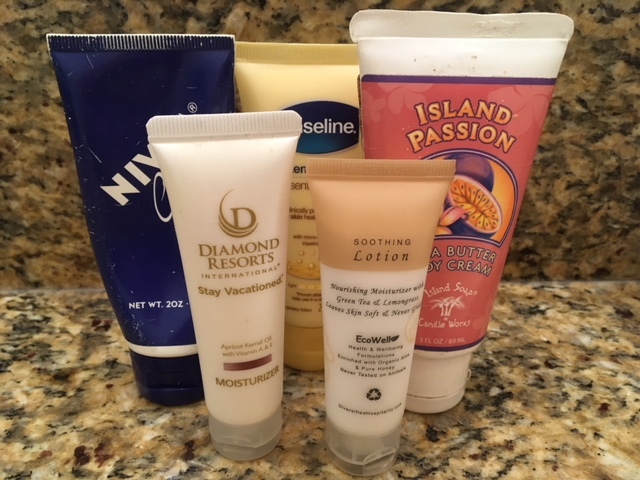 Downsizing has already provided some surprises, like six travel-size containers of hand & body lotion from previous travels (I found one more after I took the picture). We didn’t bring much with us when we moved to Kaua’i in 2014. Our things barely filled half of a 20-foot shipping container, and that’s with everything wrapped and packed within an inch of its life. In the almost four years we’ve been here we’ve only bought the following items: a washer and dryer, a microwave oven, a small two-shelf bookcase, a nightstand for the girls’ room, a chair for the living room, and a stainless steel worktable for the kitchen. Other than new clothes and replacement electronics, that’s it. But there is still So. Much. Stuff. Or at least it seems that way. We’ve got around six months to get rid of all of but a very few things, which will be going into storage in July. We plan to hold a moving sale in early July to get rid of as much of what remains as possible. We started our downsizing last month by cleaning off one set of stainless shelves in the garage and getting them ready to hold items that will be sold at the moving sale. This month I’m cleaning out the hallway closets (which we use for pantry storage), and next month I want to declutter the tansu in the living room, clean out my bedside table, and get started in the kitchen. Friends Cheryl and Alan bought several pieces of furniture from us when they visited last December. They will be moving here in early summer and our things will get them started on furnishing their Kaua’i home. Our landlord also wants to help up sell some things, and he has loads of contacts around the island. Combined with a big moving sale in early July, we’ve got our fingers crossed that almost all items will be taken care of and gone, and our travel savings total a little larger. However, before July arrives, there’s an awful lot of stuff around here that we don’t intend to sell but that’s still usable and needs to go. We’ve given ourselves a goal of taking at least one bag to a local thrift store every month. So far we’re on target this month to take at least four bags. The other day I went through and cleaned out the girls’ closet, a veritable gold mine of junk, and filled three of those bags with clothing that’s no longer worn, purses, tote bags, etc. Every day though I try to put at least one thing into the thrift store bags. We’re using up odds and ends of travel-size items we’ve accumulated over the past four years. It took us over two years to downsize for the move over here, but that provided an invaluable experience and a solid roadmap for getting it done now. The most important lesson we learned was we had to work at it every day, even if it was only one thing that got tossed or put on the “for sale” pile. We’re also trying to downsize food supplies as we go. Although buying in bulk is the way to save here, we’re trying not to buy as much at Costco as we have been in the past. We’re trying to use up supplies on hand, and buy more items individually as they’re needed. We don’t know yet how much it will affect the budget or even if it will. And so it goes, or hopefully at least most of it. Previous Post An Invitation . . . I remember the first time I went to an estate sale. It was so, so sad – all those rooms of stuff that the kids didn’t want. I vowed then that I would never do that to my children, and the truth is they are already telling us they really don’t want much of anything. Maybe a few pieces of Japanese porcelain, maybe some of the artwork, but that’s all they’re even remotely interested in. Even with a deadline some days it still feels overwhelming even though we have so much less than we did before we moved over here. We just keep plugging away at it and hope it gets done on time. I’m shocked with Brett’s ruthlessness at times – I feel like he’d prefer we keep nothing! Your mother sounds much like Brett’s mom, who got rid of nothing. It took Brett’s sister and her husband many, many days to go through her stuff when it was time for her to move out of her house, and his sister is not a minimalist. My grandmother never got rid of anything – it took my mom and her sisters many, many days to go through her stuff when she moved into a nursing home. I have something of an idea of what you’re going through, and neither Brett nor I want to leave anything like that for our children to tackle. We have around five or six 1000-piece puzzles which we’re sending to Meiling. She still loves doing them – when she was six years old she could do a 1000-piece puzzle on her own in less than a week! I know exactly what you mean about things “taking root” once it’s in the house. The girls were especially bad about this, with anything that touched their fingers becoming a treasured keepsake. They’re better now, and in fact I’m giving YaYu a trash bag (or two) this weekend and having her go through her room to at least get started on getting rid of things. I want stuff to go because I’m tired of having to keep it clean. Less stuff means less work for me, and more time for things I enjoy, like reading and writing, and travel! I started decluttering last week and have a long way to go. I did sell 5 things on eBay this week and that was hugely motivating. Books are one of my downfalls. There is a section under the basement stairs that I am dreading….dark, awkward, and crammed full…..probably spiders too. Where is a Harry Potter wand when you need one?! Love your determination and the trip is a HUGE carrot in front of you! Are you selling your books on eBay? Or Amazon? Have you tried Powell’s online? We used to own so many, many books – boxes and boxes and boxes of them made every move. And then we sold a few of them to Powell’s in Portland and made $400. When we realized we didn’t miss them we sold some more, and eventually trimmed down from 16(!) bookcases to one. We downsized those too and moved just a few books over here with us, but realized we’ve never looked at or even thought about most of them, so they are going too. Same for the cookbooks. Getting over our book obsession took a while, but we’re happy now with our Kindles, and downloading books from the library. The upcoming trip really is a big motivator to downsize, and think carefully about what we use and want to keep going forward. I listed two books on Ebay but there was no interest. I will check out Powell’s online. Thank you for the suggestion. I inherited many books – some that I want to keep, but several that I don’t. I have no problem donating more current books to our library for its annual sale and dropped off two large bags of books today. What did sell this week on eBay are three shirts, a DVD, and a huge lot of Harry Potter trading cards, which I had purchased for my son years ago at a yard sale for 50 cents and just resold for $6.50 plus shipping! I’m tired of living with so much stuff combined with my son being an only child and I don’t want him to have to muck out all this if something happens to me. I think decluttering is like peeling the layers of an onion: with each round there is more confidence/ability to let go. When my wife’s dad died it took us the better part of a week to empty out his home in Florida. Most of it was trash and junk: large, black trash bags full of papers, old magazines, and junk mail. In the end Betty and her brother wanted almost nothing except some photographs, a favorite hat, and a few mementoes. Being ruthless ahead of time is a gift to our children. I agree, Bob. That first estate sale I visited was a real eye-opener (and so sad), and I remember my mom’s and aunt’s despair when they emptied out my grandmother’s home. Both contained lots of trash and out-of-date things that no one could use or wanted. I took very little from my parents, just a few photos. I work in publishing and love to read, so you can imagine the amount of books I once had. When the Kindle came out, I stopped buying physical books because I just didn’t have the space anymore and started buying eBooks and I also now take a lot of books out from the library. They have a staggering amount of eBooks! Now, I only buy physical books when it’s something I’m using for reference that I know I will use again and again, and only have a small number of those (six or so). I visited Powell’s a couple of years ago and was amazed! Definitely a book lover’s paradise. It’s nice to see a bookstore do so well since there are so few of them left. Moving is a huge motivator. I’ve moved quite a few times and each time I was able to get rid of more and more, but I still have way too much stuff. Since this is a long weekend, I’ve been using my time to sort through and either sell or donate stuff. Your decluttering updates are very motivating! Powell’s is amazing. I always loved going there just to look. But I rarely bought from them – I was usually there because I was selling some of our books! These days I’m all about the eBooks. Everytime I think I’m getting a handle on things I open another cupboard and realize there’s still LOTS of work to do and lots left to get rid of. I was happy though that YaYu started in on her room this weekend. Lots of work to do there as well, but at least she’s making progress.